Went to a funeral today- supporting a friend. In fact, a family that my family has been supporting. So I guess today I could be an observer. I had met the person once or twice before he passed away, but as I said before, I was there to support a friend. It was my first experience at a non-religious service; an experience I found both unsettling and sad. Being a Christian and regular attender at church services, I am used to the structure of a christian service. I know where I am and where the service is going. It was also sad because there was no hope. Meant to be a celebration of a life well lived, it became a remembrance of a loved one now lost forever. Nothing wrong with that I spose, but so sad. No hope of seeing them again in heaven. No hope in God and His awesome promises and power. I am a ‘people’ person- I do not like to see anyone in pain. To see someone you know crash into tears is hard for me to see. I am ‘wired’ to want to help, assist, comfort. Where am I going with this? I don’t know. Maybe I just needed to get some of these things out of my brain and into written form. All I know is, I want my funeral to be a true celebration- that I am home with God. That my friends and family can celebrate the same hope and faith together. That we will see each other again. Am starting to get frustrated! I've started to read other people's blogs; get an inkling of an idea or the overall gist of the post- want to blog about it, but then can't connect the dots coherently. I've now got 2 posts brewing but all I've managed to do is write some really wordy and useless dribble. Am I trying too hard? Probably. Either that or not patient enough. And I thought I could change the world- or at least my little patch of it. There is a new blogger on the block. He's not only a friend but my brother too. Seems I still have some older sister persuasion techniques up my sleeve! Author jafa73Posted on June 19, 2006 June 19, 2006 Categories Blogging1 Comment on A friend blogs! On May 22 I wrote, what I called, Song for Today . On that day, as on other days in the past twelve years, I was mourning my singleness, and wondering if I would ever meet 'that special someone'. 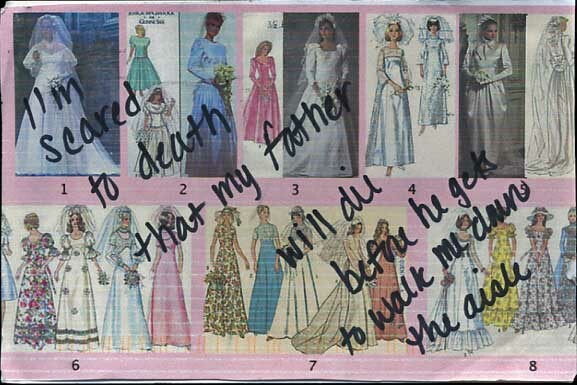 Today I was reading Postsecret and came across a postcard that I would normally easily relate too. But today is different- I don't know why but it is. Do I want to get married? Yes. Have I met someone? No. Maybe it's the hope/change thing I've been thinking about lately. Maybe I've just decided that life is for living and I can't postpone it waiting for 'him'. (Don't get me wrong, I may collapse into a heap of self pity tomorrow or the next day/ week/ month, but for today, I'm ok). Some of you might be glad to know that my posting on change will be stopping for now. I didn't get the job. I'm in the middle of being disappointed and trying to be positive about it all. In hindsight (all 24 hours of it) it was a huge distraction. It seemed to affect everything I did and was always at the back of my mind. At the beginning of the process I was concerned that I would get my hopes up for nothing. But I don't think it has all been for nothing. Change has happened- not what I was hoping for, but change nevertheless. What it is I'm not too sure. And that's ok. I think the word really should be WAIT! Change, if it's even going to happen, is going slowly. Two days later and I'm not so worried about the interview- well I can't change my responses anyway. Am wishing though that I clarified one point. Oh well.